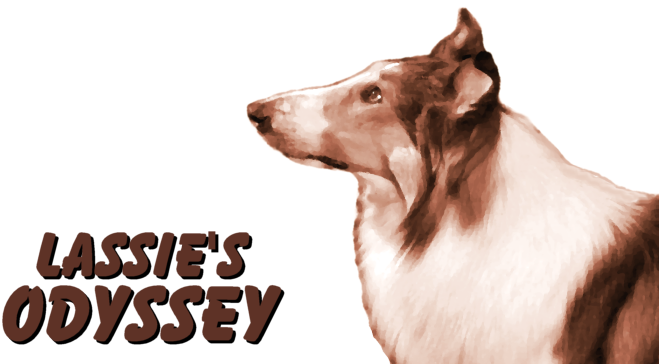 Lassie Web: Episode Guide, "The Odyssey"
The Odyssey" (or "Lassie's Odyssey," as it's more familiarly known) has its own page for one simple reason: I believe it's probably the finest Lassie story ever telecast. The quintessential Lassie tale, it mixs suspense, pathos, adventure, and many memorable scenes. It is such an iconic episode that when you see TV retrospectives and they show a Lassie clip, it's almost always from "The Odyssey." Although the series did subsequent stories in which Lassie has been separated from her family ("Look Homeward, Lassie," "Lassie the Voyager," "The Road Back," and "Make a Joyous Sound"), none of them quite ever achieved the level of emotion as "The Odyssey." The story is also notable in television history as being the first multi-part story made for television. Other programs had done two-part stories in the past, but a longer continuing story was unique. Described simply, "The Odyssey" is Lassie Come Home done with the Martin family. The story opens with Timmy and Lassie making a "friendship pact" in front of a fallen tree in which Timmy has carved a "Timmy and Lassie Martin." Timmy declares it their "special secret place" and they bury a bone to seal the pact. Later that day, they accompany Paul to the farmer's market. While Timmy is observing how his dad does business, Lassie plays with the warehouse mascot, Scratch, who unfortunately leads her into a truck being readied for transport. While Scratch leaps out of the van in time, Lassie is locked in the truck and taken away. The drivers only discover their unexpected passenger when Lassie's story is picked up by the wire services and broadcast on the radio news. When they open the truck, however, a hungry and thirsty Lassie distrusts them and escapes, only to find herself 600 miles from home. The remainder of the story, spread over the next two other weeks, chronicles Lassie's arduous journey home and the Martins' efforts to find her. Several scenes are especially vivid. The first comes after Lassie escapes the truck and has climbed to a vantage point to check "the lay of the land." A vast expanse, the ground she must cover to get home, is spread before her, appearing as daunting to the audience as it does to Lassie when she whines and turns her head. A particularly haunting scene comes several minutes later, at the end of part one, where Lassie reaches the train tracks and chooses that route as her path home. The tracks are shown in forced perspective, making the way ahead look long and weary, and then the camera follows Lassie, growing smaller, following those self-same tracks, emphasizing her smallness and loneliness. Railroad tracks still remind me of this scene. 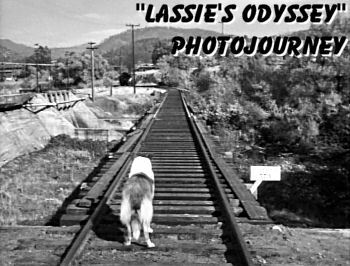 The opening scene of part two, which was reused in at least one other episode ("Look Homeward, Lassie"), presents Lassie's frightening encounter with a train on a trestle, where she has only one way to get out of its path. The driving music accompanying this scene does much to emphasize the danger. Timmy has carved his and Lassie's names in an old hollow log. Then he buries a bone there as a pact dedicating it as their "secret, special place." He and Lassie shake hands on it, then run home to accompany Paul to market. Paul asks that Timmy stay with him at the market, to start learning the business end of farming. When they arrive there, Paul and Mike Finch talk business and Timmy observes, while Lassie goes off to play with a little terrier named Scratch, whom she accompanies in and out of the produce on the docks, and in and out of the trucks being loaded for transport. But while Lassie is in one of the trucks, hiding in the back, the two drivers come along and lock her in. Scratch sees this and runs back to Timmy and Paul, making motions for them to follow. When they reach the now-empty loading dock, Paul realizes what has happened and tells Timmy that he believes Lassie was locked in one of the vans leaving the market. Lassie remains locked in the vehicle overnight, while Timmy worries for his lost companion, and, next day, when the truckers stop at a diner for a meal, they at first think they hear a dog barking. Lassie is barking, but they are distracted by the yaps of a little dog in a parked car nearby, so they don't investigate further. In the meantime, Paul and Timmy go to the offices of the Calverton Chronicle to see if putting an ad or article in might help locate Lassie. The editor, Henry Deshew, knows the Chronicle's circulation isn't that wide, but he has an idea and calls up the national news service. Sure enough, Lassie's story is picked up on the radio (it is now two days since she's been lost) and the drivers check the truck. They open the doors to find Lassie, but she growls at them and escapes into the woods. They go to the nearest town, a place called Lexington, to report what has happened. Lassie, in the meantime, climbs to the peak of the tallest hill in the area and flinches at the distance she sees between herself and home. After finding a drink, her hunger overwhelms her, so first, seeing a deer eating berries, tries that respite. When that doesn't work, she follows the example of a bear she spies catching fish in some rapids. This effort, unfortunately, is also fruitless. Now she comes upon a homestead and a man riding away on a horse. He has just put out a meal for his dog, and as Lassie approaches, the animal barks savagely at her and will not let her come near. However, Lassie notices that the dog is chained to a stump; by leading the dog in a circle and winding that chain around that stump, she gets the animal to a point where it cannot reach her, and wolfs the contents of the dish. Back at the farm, Paul gets the news that Lassie escaped from the truck near Lexington, 650 miles northwest of Calverton. Ruth suggests they put an ad in the Lexington paper. Then Timmy bursts in, having heard about the radio broadcast, with a new toy for Lassie, a "welcome home" gift of a squeaky kitten. Paul doesn't have the heart to tell him the bad news. In the meantime, Lassie passes through Lexington and makes her way to the railway line. As part one closes, we see her determinedly trotting up the tracks.  Part two begins with Lassie, now weary, still on the railroad tracks. As she crosses a trestle, a train comes. She cannot jump; the ground is too far below. She huddles next to the water barrel she has just taken a drink from, just out of range of the train. Having hadn't eaten since her meal with the dog, Lassie then chases a rabbit in the forest and catches it. Unfortunately the good-hearted collie can't bear to kill the rabbit and lets it go. Instead she swims a lake and continues on her journey, while Timmy sits by the phone, waiting for a call saying Lassie is safe. Later, in bed, Paul and Ruth discuss telling Timmy about what has happened, and Paul resolves to go to Lexington. As Lassie continues on her journey, Paul and Timmy journey to Lexington, a two-day trip. Timmy worries that whomever finds Lassie might not be feeding her properly, and Paul warns him that they don't know if she's been found. Timmy reminds him that Lassie wouldn't kill anything, how would she eat? He is certain they will find her in Lexington. As Paul drives on, he passes under an overpass built for train access. Unbeknownst to both Timmy and himself, Lassie is on that overpass; footsore and weary, she has chosen that moment to lie down and lick her sore feet. It is only after they are out of sight that she appears in sight from the road below. Here she looks down and sees a man hitchhiking. She notices the man picked up by a car and comes down from the overpass to "try her luck." However, everyone ignores her, despite her sitting up and begging. Then she sees a tall truck go under the overpass. Its top almost scrapes the overpass walls. She hurries back up to the trestle and jumps down upon the top of the next passing tall truck, which is luckily carrying hay. While Paul and Timmy comb Lexington for the missing collie, Lassie has a ruder encounter: a wolf finds her on his territory and fights with her. A hunter who spies the altercation fires his gun and the wolf flees. But Lassie is too shy to come near him just then, despite an injured paw. Two days later, a disappointed Timmy and Paul return to Calverton. They camp out on the first night, and Timmy prays to God that some miracle might occur and Lassie might return to him. Paul adds a heartfelt "amen." In the meantime, a still-injured Lassie finally approaches the hunter, who kindly cleans and bandages her wound and feeds her. While Timmy and Paul finish their journey and the depressed boy returns disconsolately to his room, Lassie recovers at the hunter's camp, accompanies him fishing, and "sings" along with his harmonica playing. As part two ends, Timmy sits at the hollow log, pretending Lassie is still with him. When she is not there to fetch a stick he throws, he puts his head down on the log and begins crying. As part three opens, some time has passed. Timmy picks through his meals. Paul tries to cheer him with tales of a neighbor's new colt and Ruth to distract him with news of a classmate's call. But he simply returns to his room after breakfast and his parents worry over him. In bed that night, Timmy cries himself to sleep and in his sleep calls out for his dog. Somehow, over the miles, Lassie hears her master's voice. Earlier in the evening, the hunter had removed her bandage and pronounced her foot well; now she awakes from sleep, licks the face of the man who has taken care of her, and continues on her way. Desperately, Ruth and Paul seek some help from Cully Wilson. A stray dog on his farm has given birth, and the puppies are just ready to give away. Cully picks out a pup with a blaze down her face and Paul asks if he will present the pup to Timmy, to perhaps "give him something to love again." Cully brings the puppy to the farm and the little dog is so charming and Cully so persuasive that Timmy agrees to "take care of her" for a little while, at least until Lassie comes home. Lassie, meanwhile, still toils over road and dale, about to take to the train tracks when she sees a better route crossing a lumberyard. She picks her careful way over a stream full of logs and must swim another lake. Next morning the restive puppy wakes early. Placed on the floor by Timmy, who claims it's Saturday and he gets to sleep late, she finds Lassie's welcome-home toy. Timmy gets angry with her for playing with it and takes it to bed with him, leaving the puzzled pup alone. Later that day he bicycles to Cully's house to return the little dog. Cully decides it's time for a talk. His gentle but firm words make Timmy realize that there is a very slim chance of Lassie's returning to him, as it's over three weeks since she was lost. Nevertheless, he tells Cully that he's not ready for another dog, not just yet. A little while later, Ruth finds Timmy cleaning some things out of his closet: Lassie's toys. When questioned, he tells her bravely that he is getting rid of them because he knows Lassie is never coming home again. He doesn't believe she's dead, but has found a new home. He takes all the toys, including the welcome-home gift, to the hollow log, their "secret special place," and digs a hole there to bury them. He has dumped the toys in the hole and is just about to cover them when he hears a familiar bark. Looking up, he sees Lassie at the top of the hill. Dropping the shovel, he runs to meet her and they come together in a joyous welter of tears and fur. Lassie has come home. Interestingly enough, this story is set apart from the rest of the season by using little of the typical series incidental (background) music. Some of the musical themes are Raoul Krausshar's, reused from the Jeff episodes [e.g. the opening scene of part one, accompanying Lassie and Scratch's romp in the warehouse, etc. ], others are new compositions, later used in other episodes. The music in the train/trestle scene is very threatening and very effective. It sets the story apart to emphasize this is a special tale. Music also plays a part in creating the mood in the closing scenes of part three, where Timmy comes to believe Lassie is never coming home again and decides to bury her toys. The scenes, first a talk with Cully, then the scene in his room with his mother, and finally back out at the fallen tree, are punctuated with violins calculated to keep you in tears. It's kept me in tears for over 50 years now and shows no sign of stopping.